Canterbury DHB’s hospital shuttle marks a significant milestone this week. 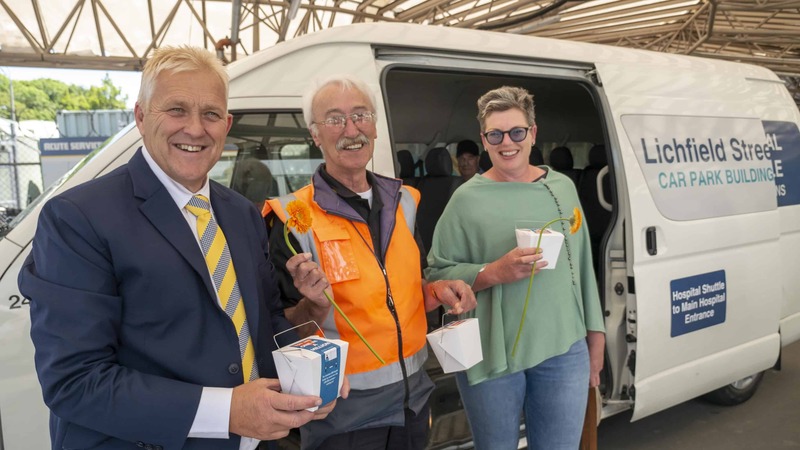 The shuttle service has helped one million people get to and from the Christchurch Hospital campus in the four years that it has been operating. The shuttle service started in October 2014 after work began to prepare the site behind Christchurch Women’s Hospital for construction of the new Acute Services building. Because of space constraints, the existing public car park at the rear of the hospital had to close, along with almost all staff parking. Parking on site was restricted to emergency and mobility parking only. Acknowledging the significant need for helping people get to and from the hospital, the DHB begun running two shuttles between the hospital and the City Council’s Metro/Old Brewery public car park on St Asaph Street, a short distance away. In the years since, we have increased the number of shuttles to four and have moved the whole operation twice, first to the Deans Ave site (the old saleyards) in December 2015 and this year in July to the Christchurch City Council’s Lichfield Street Car Park building at 33 Lichfield St – where passengers can now park under cover to catch the shuttle to the hospital. Canterbury DHB Chief Executive David Meates says the shuttle scheme was set up as a temporary stop-gap to help ease parking issues at the time. “The hospital is a busy place with around 4,000 patient, staff, visitor and courier movements around the campus every day. We know that parking in the area is difficult and contributes to the stress people who are already in a stressful situation are feeling. We are still about two years out from a solution, so we appreciate everyone’s patience and understanding during this time. In its first month of operation the shuttles moved 2,546 people. Now there are more than 5,000 people a week using the shuttles.